روشندل, امین, کریمی, فرید, سیاهکوهی, حمیدرضا, جواهری نیستانک, علیرضا. (1393). تضعیف نوفههای تصادفی مقاطع لرزهای با استفاده از ترکیب تبدیل زمان- بسامد و تجزیه مُد تجربی. 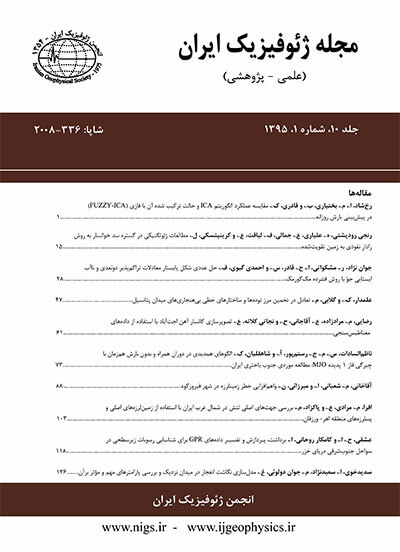 مجله ژئوفیزیک ایران, 8(1), 126-139. امین روشندل; فرید کریمی; حمیدرضا سیاهکوهی; علیرضا جواهری نیستانک. "تضعیف نوفههای تصادفی مقاطع لرزهای با استفاده از ترکیب تبدیل زمان- بسامد و تجزیه مُد تجربی". مجله ژئوفیزیک ایران, 8, 1, 1393, 126-139. روشندل, امین, کریمی, فرید, سیاهکوهی, حمیدرضا, جواهری نیستانک, علیرضا. (1393). 'تضعیف نوفههای تصادفی مقاطع لرزهای با استفاده از ترکیب تبدیل زمان- بسامد و تجزیه مُد تجربی', مجله ژئوفیزیک ایران, 8(1), pp. 126-139. روشندل, امین, کریمی, فرید, سیاهکوهی, حمیدرضا, جواهری نیستانک, علیرضا. تضعیف نوفههای تصادفی مقاطع لرزهای با استفاده از ترکیب تبدیل زمان- بسامد و تجزیه مُد تجربی. مجله ژئوفیزیک ایران, 1393; 8(1): 126-139. تصویرسازیلرزه‌ایبه‌شدتبهکیفیتداده‌هایلرزه‌ایوابستهاست. تفسیرساختاریوچینه‌ایمقاطعلرزه‌ای کهحاویکمترینمیزاننوفه تصادفیوهمدوسهستند،بهمراتبراحت‌تراست. نوفه‌هایمتعددیدرمقاطعلرزه‌ایدیدهمی‌شودکهدستهمهمیاز آنها،نوفه‌هایتصادفی‌اند.تضعیفایندستهازنوفه‌ها، به‌خصوصزمانیکهنسبتسیگنالبهنوفهکمباشد،بسیاردشواراستتاکنون روش‌های گوناگونی برای تضعیف نوفه‌های تصادفی عرضه شده است که هرکدام مزایا و معایب مربوط به خود را دارد. در این مقاله سعی شده است که از روش جدیدی برای تضعیف نوفه‌های تصادفی در حوزه t-f-xاستفاده شود. برای این کار با استفاده از تبدیل‌ Sتعمیم‌یافته مقطعلرزه‌ای از حوزه t-xبه حوزه t-f-xانتقال داده می‌شود و سپس در این حوزه تجزیه مُد تجربیEmpirical Mode Decomposition , EMDدر راستای مکان برای یک زمان و بسامد خاص اِعمال می‌شوداولین تابع مُد ذاتی به‌دست آمده از روش تجزیه مُد تجربی، سریع‌ترین نوسانات را در داده‌ها نشان می‌دهد. به این معنی که بزرگ‌ترین مؤلفه‌های عدد موج (مربوط به نوفه) در اولین تابع مُد ذاتی موجود است. بنابراین برای افزایش نسبت سیگنال به نوفه می‌توان اولین تابع مُد ذاتی را از سیگنال اصلی کسر کرد. نوفه تصادفی شامل همه بسامد‌ها است و برای این که بتوان نوفه تصادفی را در مقاطع لرزه‌ای تضعیف کرد، می‌توان برای هر بسامدی روش حذف اولین تابع مُد ذاتی را اِعمال کرد. در روشی جدید با استفاده ازالگوریتم مبتنی بر آستانه‌گذاری بازه‌ای روی تابع‌های مُد ذاتی که به نوفه تصادفی آلوده هستند پاک می‌شودوبعد از تضعیف نوفه مقاطع لرزه‌ای با استفاده از معکوس تبدیل Sبه حوزه t-xبرگردانده می‌شوند. در این مقاله الگوریتم پیش‌گفته روی مقاطع لرزه‌ای مصنوعی و واقعی اِعمال و با روش ترکیب تبدیل فوریه و تجزیه مُد تجربیمقایسه می­شود. Seismic records are generally affected by various types of noise, such as ground rolls, multiples, random noise, reflection and reflected refraction from near surface structures. Random noise resulting from random oscillation during data acquisition is one of the most important and harmful noises that exist in seismic data over all times and frequencies. Much effort has been made to attenuate this type of noise from seismic data. The predictive filter is commonly used for random noise attenuation from seismic data. This filter can be used in various domains such as the f-x domain (Haris and White, 1997) and the discrete Cosine domain (Lu and Liu, 2007). Bekara and van der Ban (2009) attenuated the coherent and random noises using a combination of empirical mode decomposition (EMD) and Fourier transform. EMD decomposes a time series into a finite set of signals called intrinsic mode functions (IMFs). They represent different oscillations embedded in the data. They are built to satisfy two conditions: (1) The number of extrema and the number of zero crossings must be equal or differ at most by one, and (2) at any point the mean value of the local maxima envelope and the local minima envelope must be zero. Bekara and van der Ban (2009) transformed seismic section from the t-x domain to an f-x domain by Fourier transform. Then, they applied EMD to a constant-frequency slice in the f-x domain and removed the first IMF. In the FX-EMD method, the denoised seismic section can be obtained by reversing the EMD and Fourier transform, respectively. The time–frequency transform of a signal shows a variation in the frequency contents of a signal with time. Ideally, the time-frequency representation only provides information about the frequency moments without mutual information about the adjacent instants. Stockwell (1996) introduced the S-transform which is a combination of short-time Fourier (STFT) and wavelet transforms. It uses a variable window length and the Fourier kernel. However, the S-transform suffers from a poor energy concentration in the time-frequency domain. It has a poor time resolution at lower frequencies and a poor frequency resolution at higher frequencies. Sahu et al. (2009) proposed a modified Gaussian window which scales with the frequency in an efficient way to obtain a better energy concentration of the S-transform. Han-peng et al. (2011) used the time-frequency transform instead of Fourier transform (TFX-EMD) for considering the nonstationary property of the seismic data. They obtained the denoised seismic section by applying the EMD to a constant-frequency slice and removing the first IMF in t-f-x domain. Due to the presence of random noise in the other IMFs, removing the first IMF is not always an appropriate approach. One of the best algorithms in EMD-based noise attenuation is the interval thresholding of the IMFs. The main idea of this algorithm is to determine an aproperiate threshold value and to apply it to the considered IMFs. In this study, we modified the TFX-EMD algorithm by changing the EMD denoising strategy. We used the interval thresholding of IMFs instead of removing the first IMF in the t-f-x domain. We evaluated the efficiency of our method on both synthetic and real seismic sections and compared the obtained results with those of the FX-EMD and traditional TFX-EMD methods. The comparison shows that the new EMD denosing strategy in the t-f-x domain can effectively suppress random noise and has a better performance than the other two approaches. Also, in our method, unlike the FX-EMD and traditional TFX-EMD, the steep events are preserved. امینی، ا.، 1390، بهبود تضعیف نوفه‌های لرزه‌ای اتفاقی توسط تلفیق دو روش فیلتر کردن بسامد- مکان و تجزیه مُد تجربی: پایان‌نامه کارشناسی ارشد، موسسه ژئوفیزیک، دانشگاه تهران. روشندل کاهو، ا.، 1388، بهبود تبدیل‌های زمان- بسامد در مطالعه داده‌های لرزه‌ای: رساله دکتری، موسسه ژئوفیزیک، دانشگاه تهران. روشندل کاهو، ا.، و نجاتی کلاته، ع.، 1390، تضعیف نوفه‌های اتفاقی در داده‌های لرزه‌ای با استفاده از تجزیه مُد تجربی: مجله ژئوفیزیک ایران، 5، 61-68. Auger, F., Flandrin, P., Goncalves, P., and Lemoine, O., 1996, Time-frequency toolbox for use with MATLAB: CNRS, France. Bekara, M., and van der Baan, M., 2009, Random and coherent noise attenuation by empirical mode decomposition: Geophysics, 74(5), V89–V98. Boashash, B., 2003, Time Frequency Signal Analysis: A Comprehensive Reference, Elsevier. Gabor, D., 1946, Theory of communication: J. IEEE (London), 93(III), 429-457. Grochenig, K., 2001, Foundations of Time–Frequency Analysis: Boston, Birkhauser. Haris, P. E., and White, R. E., 1997, Improving the performance of f-x prediction filtering at low signal-to-noise ratio: Geophysical Prospecting, 45, 269-302. Han-Peng, C., Zhen-Hua, H., and De-Ji, H., 2011, Seismic data denoising based on mixed time-frequency methods: J. Appl. Geophys., 8, 319-327. Huang, N. E., Shen, Z., Long, S. R., Wu, M. L., Shih, H. H., Zheng, Q., Yen, N. C., Tung C. C., and Liu, H. H., 1998, The empirical mode decomposition and Hilbert spectrum for nonlinear and nonstationary time series analysis: Proc. Roy. Soc. London A, 454, 903–99. Issaoui, H., Bouzid, A., and Ellouze, N., 2012, Comparison between soft and hard thresholding on selected intrinsic mode selection, 6th International Conference on Sciences of Electronics, Technologies of Information and Telecommunications, 712-715. Kopsinis, Y., and McLaughlin, S., 2008, Empirical mode decomposition based softthresholding: 16th Eur. Signal Process. Conf. (EUSIPCO), 42-47. Kopsinis, Y., and McLaughlin, S., 2009, Development of EMD-based denoising methods inspired by wavelet thresholding: IEEE Trans. Signal Processing, 57, 1351-1362. Lu, w., and Liu, J. L., 2007, Random noise suppression based on discrete cosine transform, 77th Annual International Meeting, SEG, Extended Abstracts, 2668-2672. Mallat, S., 1999, A Wavelet Tour of Signal Processing: 2nd edition, Elsevier. Flandrin, P., Rilling, G., and Gonc¸alv`es, P., 2005, EMD equivalent filter banks, from interpetation to applications (in N. E. Huang and S. Shen, Hilbert-Huang Transform and its Applications), World Scientific Publishing Company, first edition. Proakis, J. G., and Manolakis, D. G., 2007, Digital Signal Processing, Principles, Algorithms, and Applications, Pearson Prentice Hall. Sahu, S. S, Panda, G., George, N. V., 2009, An improved S-transform for time-frequency analysis, Advance Computing Conference, IEEE International, 315-319. Stankovic, L., 1994, An analysis of some time-frequency and time-scale distributions: Ann Telecommun., 49, 505–517. Stockwell, R. G., Mansinha, L., and Lowe, R., 1996, Localization of the complex spectrum: The S-transform, IEEE Trans. Signal Process., 44, 998–1001. Trickett, S., 2008, F-xy Cadzow noise suppression, 78th Annual International Meeting, SEG, Extended Abstracts, 2586-2590.